7 Action News received disturbing new undercover video showing dogs at an animal testing lab in Michigan. The U.S. Humane Society says the footage shows dogs getting doses of pesticides and drugs. According to the group, it's investigation found beagles and hounds suffering and dying. 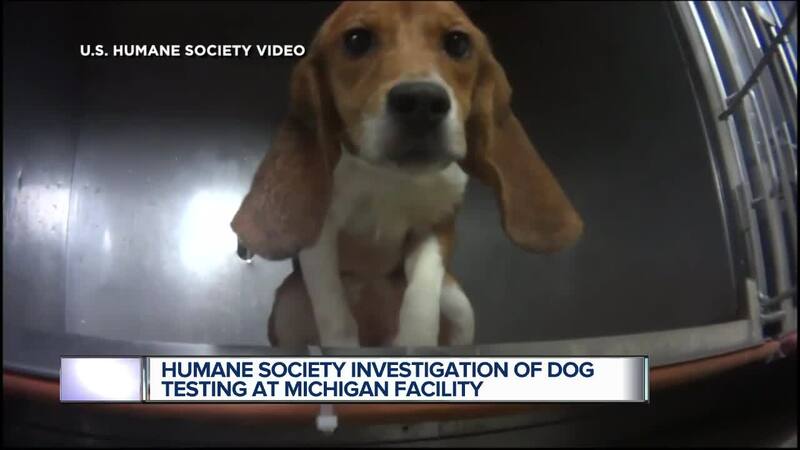 DETROIT — WXYZ received disturbing new undercover video showing dogs at an animal testing lab in Michigan. 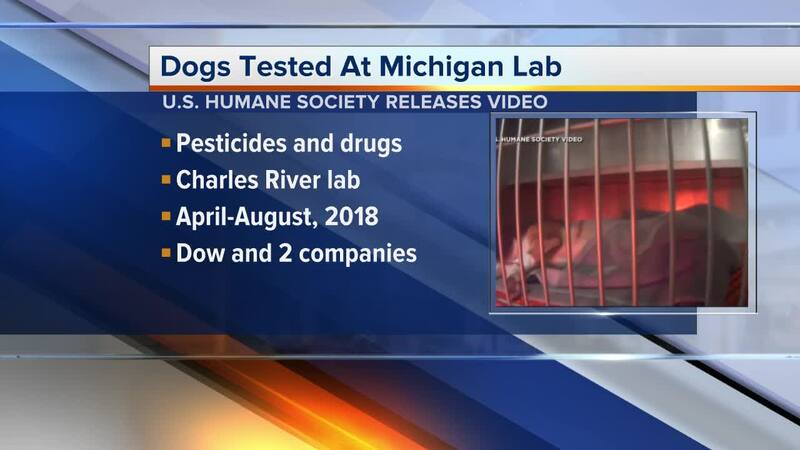 The Humane Society of the United States says the footage shows dogs getting doses of pesticides and drugs. According to the group, its investigation found beagles and hounds suffering and dying. The video was supposedly shot at the Charles River Lab in Mattawan, Michigan, between April and August 2018. Experiments were carried out on behalf of three companies, including Dow Chemical, which is based in Midland, Michigan, according to the Humane Society. The organization is demanding that the testing stop and the dogs be released. The Dow Chemical company responded to the report Tuesday. The company said it is required to test pesticides and fungicides on dogs to make sure they aren't too toxic. The HSUS investigation at the Charles River Lab found some dogs had their jaws surgically broken to test dental implants. Others had drug pumps inserted beneath their skin. Currently, the focus is on 36 beagles being force-fed toxic chemicals sometimes up to four times a day for almost a year. "We need to get out of this cycle of using dogs just because we have always used them," said Kathleen Conlee, vice president of animal research issues at the Humane Society of the United States. HSUS investigators went undercover at Charles River Lab for nearly 100 days in spring and summer of 2018. "I don't think everyone in there is an uncaring person. I've been there myself but hopefully someday they will see the light and join us in trying to end abuse of animals like this," Conlee said. Companies pay the lab to carry out their product testing on animals. That includes Michigan-based Dow Chemical. The company contracted the lab to use 36 beagles for a year-long test on the toxicity of a new fungicide. The program started in summer 2018 and will be completed in July 2019. "These dogs were getting force-fed pesticides every day for a one-year long pesticide test that is widely considered unnecessary. These animals are still alive today but will be killed in July," said Conlee. U.S. law only requires a 90-day test to get new pesticides approved. However, Dow said that Brazil requires a year of testing, hence the long test underway in Michigan. HSUS said that's not the only way dogs suffer at Charles River Lab. Its undercover operatives said dogs had their chest cavities opened up to see how that area tolerated having drugs pumped in. Others had invasive surgeries to test an amyotrophic lateral sclerosis, or ALS, drug. The Humane Society said the long-term results don't justify the cruelty. "Over 90 percent of drugs that show promising results in animals ultimately fail in humans. We want to see better tests that are relevant to humans," Conlee said. Dow has a strong commitment to ensuring the safety of our products, and the care and well-being of animals. Specifically, Corteva Agriscience™, the Agriculture Division of DowDuPont, which includes Dow's former fungicide business, has been working closely with the Humane Society of the U.S. for many months to encourage Brazil's Agência Nacional de Vigilância Sanitária (ANVISA) to amend its animal test requirements for pesticides. Once Corteva is given certainty that the study is no longer required, they will stop the study immediately. Animal testing is not something Dow undertakes lightly, but neither is it something the Company can discontinue when it is required by regulatory authorities. Dow keeps its use of animal testing to an absolute minimum. Dow is committed to finding alternatives to animal testing and has established a Predictive Toxicology team dedicated to this goal. Dow scientists actively advocate for alternative methods by engaging global regulatory agencies and collaborates with governments, animal welfare organizations and researchers. All this is evidence of our commitment to the 3R's - reducing, refining and replacing the use of animals in toxicology testing. The U.S. Food and Drug administration often requests companies provide numerous animal tests on products, and sometimes it includes dogs.